The game is basically a retelling of the ending of the 1983 movie where Tony Montana rebuilds the empire he lost. He fights his way out of the raid in his home and gets to safety at the expense of everything he owned. All he has is his balls (literally, there’s a meter for them) and his word. Scarface is basically a typical Grand Theft Auto clone, and that term is fitting because it feels like a step down from GTA Vice City. You’re given an open world where guns are allowed but not encouraged and no one locks their car doors. You’ll be dealing drugs from the bottom of the criminal totem pole and you’ll make your way back up no matter what. “The world is yours!” says the game. “But is it though? !” I retort. This iteration of Miami feels like a tad underwhelming. Like in Grand Theft Auto: San Andreas, you can swim in your nice suit but if you swim too far or in deep parts, a shark eats you. I wish I were kidding but this startled me on my first swim after failing to jump a ramp. The appeal about open world games is the exploration. A great sandbox for a game is filled with little intricacies that make you think the world is alive and well, even if it isn’t. Walking around gives you the opportunity to complete conversations with pedestrians which gives you an idea of how Tony Montana talks to people - how he flirts, how he brags, and how he talks to others. The game’s depiction of Miami feels like a slight level down from Grand Theft Auto: Vice City. Despite the ability to actually talk to the people in the world, it still feels a bit lifeless when compared to the big boys of open world games. Nighttime really feels like night in the game as there isn’t anything happening in the world. Not a lot of lights, not a lot of life, aside from the Babylon Club which is open twenty four hours a day. That’s gotta be a hefty electric bill. Like the Babylon Club, there are certain businesses for you to buy out so you can operate your cocaine empire. Each of these businesses have a mission that you have to deal with personally, as is with any open-world game. You can’t just delegate it to a henchman. There are some annoying missions that involve you having to protect the owner because for some reason, they didn’t think of hiring personal bodyguards when they got into the cocaine dealing business. Buying these businesses out would help you on a drug run by delivering cocaine and collecting money like a Pizza Hut delivery man on 14 cans of Monster Energy. When exploring the game world, you might get bored with the blocky environment, making you want to kill everything in sight. But because of Tony Montana’s code of honor, you can’t kill innocents so if a random middle aged weirdo gets in your crosshairs in the middle of a gang war, your gun basically jams and your eyeballs have flown up all the way to Miami Beach. On paper, this lets Tony Montana’s character have a sense of honor but that doesn’t mean it’s actually fun when the time calls for it. That sense of honor is useless when you’re on a drug run with two hundred thousand dollars on the line and some random bystander decides to run in front of your gun, letting the enemy get an advantage. If you do manage to kill someone (only with your car, strangely), instead of a star rating for a wanted level, you get a bar around the mini-map. Fill that bar and the game explicitly says “You’re fucked” and the HUD disappears. You can stay in your car or your mansion and prolong the inevitable shot to the face by the cops who’ve had enough of your crap. Alternatively, if you have boat access, you can ride away from the game map and instantly lose your heat by driving to the islands which are outside the cops’ jurisdiction. The violence delivered feels gratuitous. I can believe an AK-47 tearing the leg off of a drug dealer and a desert eagle literally making someone’s head explode and the neck spewing blood out like a chicken. When it happens the 45th time, however, one can get tired of giving others body amputations with bullets. By doing headshots and dislocating enemy gangs’ limbs, your Balls meter fills up and once it does, you can go into Rage Mode. This turns the game into a first person shooter where you’re invincible with infinite ammo. Now you’re enemies have a lot more to fear but at least their horrible lives will be over thanks to you. One big gripe I have is that Tony Montana can’t jump. Sure, games of today have Watch Dogs and Assassin’s Creed don’t have a dedicated jump button but at least you could do some parkour and I doubt Mr Montana didn’t do any in his bright blue suit. Unarmed combat doesn’t feel nice. It’s basically the same as a GTA game and once in a while, when Tony feels like it, he’ll throw a kick. It feels stiffer though as Tony’s not the most fluid fighter we have. Thank god melee combat isn’t really required except for some side missions. You can’t really win a gunfight with fists as you’re not Batman. Whenever you collect money from missions or drug runs, your income is still considered dirty and could be lost when you die. For the money to be safe, you’d have to deposit it in of the banks which would then initiate a mini-game similar to a golf game. This would determine how big of a percentage that the bank would take as a fee for cleaning the money up. Banks have to make money, of course, even if the five dollar bills have bloodstains on them. Eventually you get to buy a perk where you don’t have to do this mini-game anymore but it’s still sort of a nuisance when saving up for it. What do you use money for? For big purchases from a catalogue your banker gave you. You can buy cars, home decorations, and even big investments like a movie company or a financial company. As fun as those sound, they sound just as much fun as buying digital booster packs for Yu-Gi-Oh. It sounds like it’s something big until you find out they’re just nothing. Buying these companies would just let you skip the banking minigame and get you more suits. Personally, I would’ve recommended this if we were still in the PS2 era but this game has showed its age. I never owned an Xbox 360 nor a Wii so those could be the better versions of the game. I could be wrong but I personally never played those versions of the games in the 10 years it’s been out. I had the PS2 version because I was a Sony guy, bruther dude, and I was staying loyal. In other words, the PS2 was all I could afford at the time so I stuck to it, shut up. And after finishing The Godfather Game, I needed another open world game that was based on a gang movie. Scarface: The World Is Yours heeded the call, bringing the likeness of Al Pacino in the game, leading me to realize why his likeness wasn’t used in The Godfather game. So, isit really fun? Yes, the game’s fun but only if you enjoy it as it is, if that makes sense. It was released 10 years ago and it does feel a bit dated. Is it worth buying in 2016? No, unless you like another open world game that has a lot of violence for you to conduct. Is it better than The Godfather game? No, definitely not. 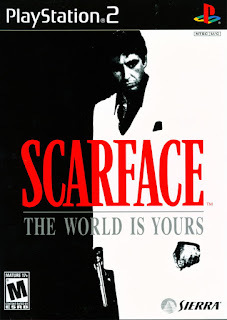 This game felt like an executive at Vivendi heard the announcement of The Godfather game and told his assistant “We should totally make an open world game based on a crime movie too! Big money!” It doesn’t scream of definite cash-in though so that’s something. It feels like a lot of money and effort have been thrown into this game and it definitely feels like it. The Godfather, however, was more polished and looks a lot better than this game. Only Tony Montana and his mansion look like they’ve been meticulously designed but the rest of the characters and textures look like rejected from San Andreas. So if you like bloody swear-filled violence with bad textures even for PS2 standards, go ahead and look for a copy. Otherwise, I’d recommend you play something else.